This month’s Charcutepalooza challenge had the whiff of Oktoberfest. Not only were we asked to make and stuff more sausages, we were asked to blend and emulsify the meat filling to a consistency found in a hot dog, bratwurst or weisswurst. I chose the bratwurst, partly for it’s happy collaboration with beer and partly for its relative ease compared to the hotdog. Baby steps, please! Yes, my husband is Danish and bratwurst is German. At the end of the day, they share a border, and, while their history may have been a tad testy, these 2 countries also share a culinary love for sausages. In Denmark, sausage is the fast food of choice, with carts distributed wherever people roam. While I may be hunting down a cup of coffee upon international arrival from the U.S., my husband will sidle up to the nearest airport sausage cart with both of our kids in tow, and order a flight of pølse with mustard, bacon and crispy onions. Apparently his gene pool is the strongest. Or, more specifically, the unflinching interest my dog is showing in me while making bratwurst is unsettling. I have never succeeded in getting our terrier to consistently obey me. Now I know how. Sausage, sausage everywhere…on the counters, on the floor, in the sink, in the bowls, in the mixer, in the grinder, in my hair, under my nails, on my clothes and countless kitchen towels. And did I mention that my dog is intently staring at me? White pepper is traditionally used in dishes that should not show dark flecks of black pepper. But visuals are not the only difference. White pepper has a potent spiced flavor which, in large amounts, I don’t care for. Too bad I only figured that out after I added a heaping spoonful to the filling. I am 6 hours into the meat stuffing process, which includes handling, chopping, chilling, grinding, chilling, mixing, frying, tasting, chilling, stuffing, chilling, poaching, frying and tasting ground, blended meat. I think I’ll tuck these babies away in the freezer and take a time out. Then I can rename this title to: Absence makes the heart grow fonder. But, no, I am blending and stuffing bratwurst in the company of my dog. Pass the sauerkraut and a beer, please. Especially when everything involves sausage. Truth be told, these were quite tasty, and my family gobbled them up (see title #1). I pan-fried the bratwurst and served them with thick slices of country-style bread, mustard and sauerkraut. As we ate the bratwurst, we watched Wimbledon highlights and enjoyed an ice cold Danish beer. The EU is alive and strong in Northern California. Combine mustard seeds, vinegar and beer together in a non-reactive bowl. Cover and refrigerate overnight. Transfer mustard and liquid to a small saucepan. Bring to a boil; immediately remove from heat. Cool to room temperature. Transfer to a food processor or blender. Add remaining ingredients and purée. Transfer to a glass jar or container and refrigerate overnight. Mustard may be stored in refrigerator for up to two weeks. I am so impressed that you made your own bratwurst, and it looks fantastic! And I’m with you on the white pepper….give me black flecks of pepper in my food, please. I don’t like white pepper. Black flecks nicely break up the monotony of white food. Lynda, you have me laughing picturing it all! I don’t think I am up to trying to make my own bratwurst, but perhaps the mustard!! It was the hottest day, and any descriptive language I could think of to describe it was unprintable. I’ve participated in a couple of these challenges; as one of the event sponsors, I’m not eligible for prize considerations so I pick and choose and..I chose not to do this one! Though I love the stories…it does seem that notion of ‘sausage everywhere’ is a running theme! But I love the sound of that mustard. I have a lot German blood too; I could live without ever tasting another drop of ketchup but I have a whole section of my fridge devoted to mustards. I do believe this one needs to join them! I am already thinking of the next mustard recipe I will try. You are so right about the cleanup. It’s like a decontamination unit in the kitchen after. The first time I made sausage it was even messier because I didn’t quite know what I was doing. My wife looked like she wanted to hurl. Sorry, to bring that one up! Anyway, love the mustard recipe. This challenge brought out my inner comedian. It did for you as well, I see! I made hot dogs- didn’t love ’em- your bratwurst looks much yummier. ps I am totally making your mustard! I’m so impressed that you took on the Hot Dog. Very Impressive! And I am sure, worth it! I agree, please no white pepper! 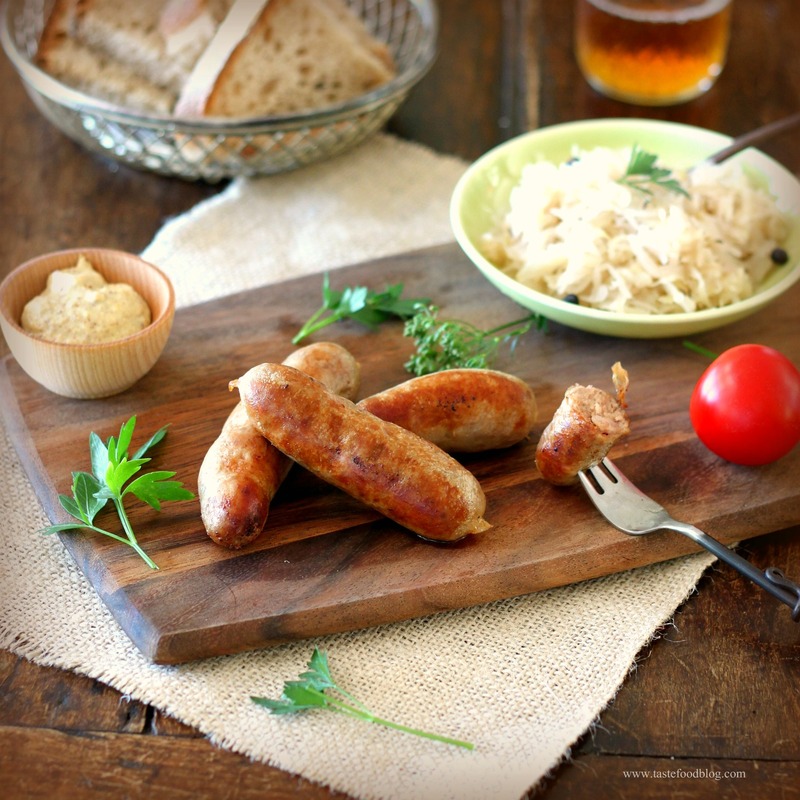 This looks amazing.Your bratwurst looks very pro..love the beer mustard recipe..so flavorful! Did you give any to the terrier in the end? These are the kind of projects that I wished my foodies friends live next door, so we could embark on these adventures together. You effort paid off. What beautiful sausages! Wishing I lived next door to eat a few as well…. Yes, the terrier was rewarded for her unflagging support. I wish you lived closer, too – I still have lots in my freezer. We all learned so much this month. Mostly, how to clean the kitchen. Our terrier was fascinated by the sausage making and intently smells my breath whenever I eat any of the Charcutepalooza projects. I believe if he had thumbs he would be a great garde manger assistant. I’m so so impressed! These bratwurst sound and look delicious. I bet your husband is thrilled! I especially love the mustard recipe. I can do that. I’m so impressed by your efforts! I don’t think I could have made it through having sausage everywhere. The final result looks so delicious though! Lynda, I hope you treated yourself to a Pimm’s cup after this adventure. I heartily agree that mustard makes everything better. How funny. 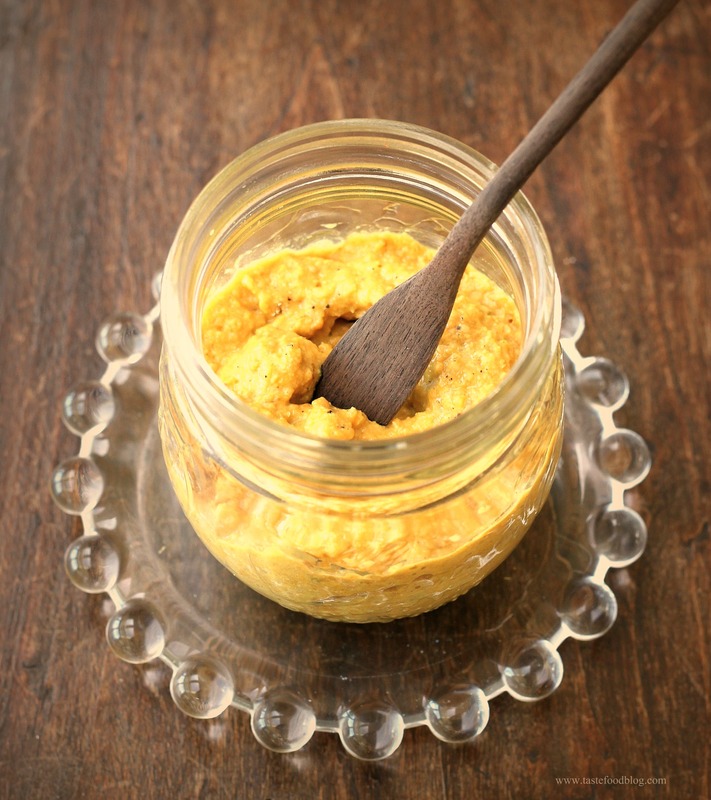 Making mustard is on my short list of things to do and here you have a wonderful looking recipe. I just love mustard but haven’t thought of starting a day or two before I need it yet. Too funny! Love the power hose (and untrained dog) can relate to both!! I can’t believe you made your own mustard – the recipe is fantastic – I am completely impressed. Mmm, mustard does make everything better! If I increase the honey to say, 1/4 cup do you think that would make it a honey mustard? Or would making honey mustard be a different thing altogether? It will certainly give it more of the honey flavor you are after. Some honey mustards also have egg in them. I made weisswurst – though not for a challenge but for a friend’s 40th Birthday Haus Party (Oktoberfest Theme) on the 15th. I am trying the mustard out this weekend. You are so right about the Dog – my 2yo Border Collie could not have been more attentive than when my husband and I were grinding the meat and stuffing the casings. Turned out great and will try them with the mustard in a few days. Thanks for the pics and mustard idea. You’re welcome – let me know how you like the mustard. I’m about to start your mustard recipe in the next few minutes. I made a couple of adjustments so I hope it works, but I’ll let you know how it comes out. Instead of the black mustard seed, I’m using a minced ancho chile (dried, of course). I’m replacing the dark beer with a blackberry witbier to go along with the “plumness” in the ancho chile, and I found blackberry honey as well that i’m going to use to compliment the blackberry beer. This is going to be the first time I ever make my own mustard so wish me luck! Good luck – let me know how it turns out!